There's trouble in Corus: a large influx of counterfeit coins, combined with rumors of a bad rye harvest, threaten the economy and well-being of the city. As prices rise, there's rioting in the streets, and something has to be done. Beka Cooper has been reunited with her mentors, senior Dogs Goodwin and Tunstall, after a bad run of partners. When the Dogs discover that the counterfeit coins are coming from Port Caynn, and Tunstall is laid up with an injury, Beka and Goodwin, accompanied by Beka's new scent hound, Achoo, and the pigeon Slapper, are sent to Port Caynn to investigate. With a cover story and some fortunate connections, Beka and Goodwin infiltrate the gambling dens of Port Caynn's underworld. The situation in Port Caynn is even worse than they anticipated: a small-minded Rogue who cares more for herself than her own people, a government official who has traded integrity for safety, and a plot that could destroy the land. Meanwhile, Beka finds herself increasingly attracted to a dashing gambler, not knowing if she can trust him. Before long, Beka is on the run, in danger from all sides. Can she uncover the evidence she needs and find a way to stop the plot, when it seems as if the entire city is out to get her? Who knew that counterfeiting could be so exciting? Bloodhound is a worthy successor to Terrier; it's a well-paced story peopled with interesting characters, from a crotchety but likable elderly silversmith, to a police Sergeant that Beka knew as a child and his companion, a man who sings as a woman in the gambling dens. Beka herself is one of the best characters I've ever encountered in fantasy. Her combination of shyness and toughness makes her quite appealing. Beka has grown and matured since the last book, as good characters should; her shyness is less pronounced, and she's grown in confidence. Yet she still retains an impulsivity that has a tendency to get her in trouble. Overall, though, I quite enjoyed Bloodhound. Rosto shippers will be disappointed that there's not much of Rosto in this book, but Beka's romantic interest here, bank courier Dale, is quite attractive and there's quite a bit of zing between the two of them. I keep waffling on this one after the fact. The lack of Rosto certainly marred it for me. 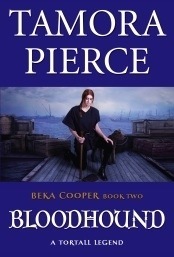 Pierce does those rakish side characters so well and I hate to see them missing. But also I was suspicious of Dale the entire time and couldn't see why Beka got so comfortable with him. Sigh. Still looking forward to the 3rd one, though. I felt torn on that. I missed Rosto - and even the scenes where he did appear didn't have the same heat - but I did find Dale quite attractive, too. I only recently saw in The Horn Book that this book is out. I actually did enjoy the first book in the series, so I'll try to find this one. Since right now I don't remember Rosto, I should be fine with his absence. You'll remember Rosto when you start reading, I think. One thing you should know is that this book does use the same journal format that Terrier does, and as I recall you don't generally like books in journal format? Although I have a vague remembrance that this one didn't bother you as much, although I might be misremembering. Wasn't the first book one of our Cybils books? I remember discussing it with you.